Stunning necklaces (and bracelet) from Scandinavia. From finding the perfect necklace to team up with that LBD to attracting positive attention with a bright shot of colour, these necklaces are great for revitalising your look in 2011. 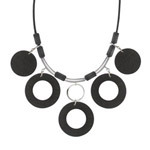 Must-have statement jewellery, this black necklace with flat wooden rings and discs is sure to create an impact at any occasion. In classic black, this necklace is a worthwhile investment for your jewellery collection. A special wooden necklace with bright mixed red wooden beads and a unique double-necklace design. Chic, feminine and eye-catching, this is one necklace that will certainly get you noticed. 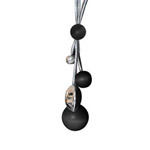 A unique new design by Aarikka, this long necklace has silver-coloured cord, metal detail and oversized wooden beads. Classic colours and a striking design combine to create an eye-catching piece of jewellery. Now available in glamorous purple and black, the Ulpukka necklace combines smooth wooden pearls and soft shiny ribbon for a unique and feminine design. The same elegant design in classic black. This necklace makes a timeless addition to your jewellery collection with its unique design and classic colour. It will complement almost any outfit and can easily be teamed up with other black earrings and bracelets. Create a stir with this chunky mixed red bracelet with wooden beads in various shapes and sizes. A bold design, the bracelet can be worn on its own or teamed up with the matching Rentukka necklace for full impact.